JERUSALEM (JTA) — Newly-appointed U.S. Secretary of State Mike Pompeo did not try to meet with any Palestinian officials while in Israel on a diplomatic trip, but emphasized that the U.S. is fully committed to achieving Israeli-Palestinian peace. 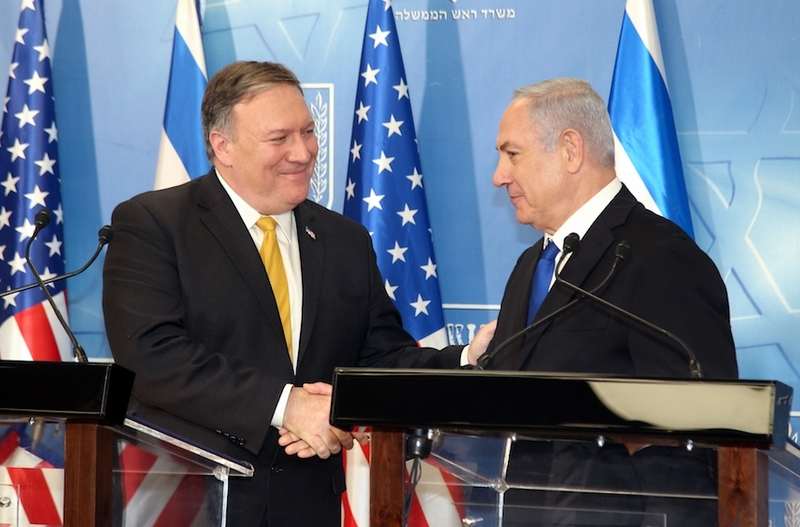 “We remain committed to achieving a lasting and comprehensive peace that offers a brighter future for both Israel and the Palestinians,” Pompeo said Sunday in Tel Aviv at a press conference with Israeli Prime Minister Benjamin Netanyahu. The secretary’s visit comes at one of the most tenuous points in Israeli-Palestinian relations in years, in the wake of continued protests at the Gaza border that have turned violent. Xavier Abu Eid, a senior official at the Palestine Liberation Organization’s Negotiations Affairs Department told The New York Times there was “nothing to discuss” for Pompeo and Palestinian leaders. Pompeo also said the United States will leave the Iran nuclear deal if it can not be fixed. “President Trump’s been pretty clear, this deal is very flawed. He’s directed the administration to try and fix it and if we can’t fix it he’s going to withdraw from the deal,” Pompeo said after meeting with Netanyahu. “I think that it is important that he is coming to Israel as part of his first visit outside the U.S. as Secretary of State. I will discuss with him developments in the region, Iran’s growing aggression and – of course – the nuclear agreement with Iran, about which there will be a decision soon,” Netanyahu said at the start of the weekly Cabinet meeting. Pompeo, a former director of the CIA, was sworn in on Thursday and then left immediately on a diplomatic trip which first took him to NATO headquarters in Brussels. He visited Saudi Arabia on Saturday and Sunday morning before landing in Israel on Sunday afternoon. On Friday in Brussels, Pompeo seemed to indicate that the United States would dump the Joint Comprehensive Plan of Action, or Iran nuclear deal signed in 2015 between Iran and six world powers, including the United States. Pompeo noted that the Trump administration had not made a final decision on whether to leave the deal and reinstate sanctions on Iran, a decision that must be taken by May 12. “Absent a substantial fix, absent overcoming the shortcomings, the flaws of the deal, he is unlikely to stay in that deal past this May,” Pompeo said, however.